I was driving to Holland to pick up quite a lot of bottles Karuizawa 1994 from Full Proof. I asked three friends if they could go along so we could get everything across the border to Sweden without any custom problems. They were not hard to convince to come along. some to great prices some not so great. But what they do have is reasonably priced Old Malt Cask (some at really great prices) and also some Douglas Laing Platinum to very good prices. This time the bargain was a 30 year old Glen Grant from 1976 for the stunning sum of 60 Euro! They had three left and we bought them all. After a good look in their two locked cabins of nice whisky we went out of there with around 20 nice bottles. A good start of our whisky weekend. A short stop at Calle’s in Heiligenhafen resulted in four Rare Malts bottles and a Tobermory 1972 for Jonne. We then continued to Hamburg were we should spend the night. We didn’t have a clue where the hotel was situated, but it said city centre, so we followed the signs to Zentrum. When we were closing in on the city centre I spotted a small café called Café Spalding. “Hey, wait a minute, wasn’t the street where our hotel is named Spaldingstrasse? Oh there is the hotel now.” A short walk later and we were sitting at the Innen Alster and drinking beer. A dinner later and we were back at the hotel and tasted some of the whisky samples we had brought with us. I had ordered 25 Ardbeg Peat Packs for a big tasting next year and we also had the chance to start the day with a little whiskytasting. Arran Amarone Wine Cask Finish, NA, bottled 2007, 55% was a bit of a disappointment. I usually like what Arran do with finishes to be able to release young whisky, but this one was not as good as some of the earlier ones, winey, spirtuous and a hint of chocolate, 77 points. Bunnahabhain, Cask 11987, 1979-2000, 20 years, Mackillop’s Choice, 58,9% was a lot better. Buttery and malty with vanilla and fruits gave it a 86 point score from me. Next one was also a Mackillop’s Choice (quite a new acquiantance for me), Dailuaine, Cask 1236, 1980-1999, 19 years, Mackillop’s Choice, 55,2%. Grass, grapes and a bitter finish rendered in a score of 80 points. The last one tasted at Weinquelle was a Bruichladdich, Sherry cask, 16 years old from 1989, OB for Hanseatische, 46%. This was a nice Laddie with cocoa, plums, flowers and sherry. I liked it and gave it a score of 86 points. Now it was time to get going and head for Holland, but first a little detour to Duisburg to pick up 4 bottles of Ardbeg Very Young. After a bit of a worry to get to the store (it’s not easy to find the way in these big cities when you have never been there before) we could pick up the 4 Ardbegs and also buy three more Ardbeg Peat Packs. The nice man in the store offered us a dram of Cragganmore, Cask 960, 1989-2002, 13 years, Signatory Un-chillfiltered, 46%. A lot of citrus in it and also a bit of soil. A bit strange but interesting enough to get a score of 83. We then looked around and spotted a shelf high up with some very interesting opened bottles. We were able to buy three drams that attracted us. Glenrothes 1979, 1979-2004, OB, 43% was filled with red apples, nuts, nice oak and a little bitterness, 87 points. Glen Grant 1965, bottled 2004 from Gordon & McPhail, 40% was my choice as it is my birthyear. A lot of fruitsweetness, raisins, peaches and cocoa pushed it into the 90’s for me. As it is from my birthyear I might have been a little biased but I put it down for 91 points at last. The third dram we bought was a Strathisla, 40 years old, G&M, 40% and it was also very good. The sherry was dominating with almonds and cocoa just behind. A bit dry finish and a score of 90 points. A very good day so far, but it was going to get a lot better! We found our way quite easily this time and arrived at Jeroen’s house around six o’clock in the evening. We started with a Glen Spey, 21 years old from James MacArthur, 55,4%. Bottled around 1990 and a very nice starting dram with it’s citrus and grass and some earthy tones. I put it down for a score of 84. Very soon after that one an Aberlour from 1963, bottled 1984, Cadenhead, 46% came to the table and now we got vanilla, fruits and a lot of sweetness. A little bit better then the Glen Spey and a score of 85. First up a Jameson bottled in the 60’s-70’s at 43%. I do have a hard time to appreciate Irish whiskey and this one was not my kind of whisk(e)y. Very spiritous, synthetic and rubbery. A low score of 45 from me. Fortunately I soon got a new dram to get my tastebuds to like me again. White Heather, 43,4% bottled in the 70’s got my mood back up with it’s fudge, chocolate, nuts and some scorchiness and 81 points. Another bottle from the 70’s was the White Horse, 43%. It had nuts and a litte bit of suphurness like from burning matches. Not bad for a blend but not more than 77 points. Jeroen had promised us a high-end tasting, so I was expecting 8-10 very nice drams, but I had never in my wildest fantasy expected the things we got. 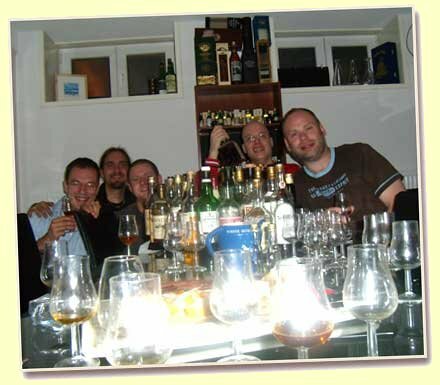 All in all we tried 50 whiskies this very long night. We started out very seriously with tastingnotes for everything but they became smaller and smaller and the last 15 drams I just put down a score, a score that obviously can’t be taken too seriously. We had a wonderful evening/night with lots of laughs, good music and marvellous whisky. When I went to bed around 3 o’clock in the morning the house was actually spinning around. Maybe that’s the way they build houses in Holland?